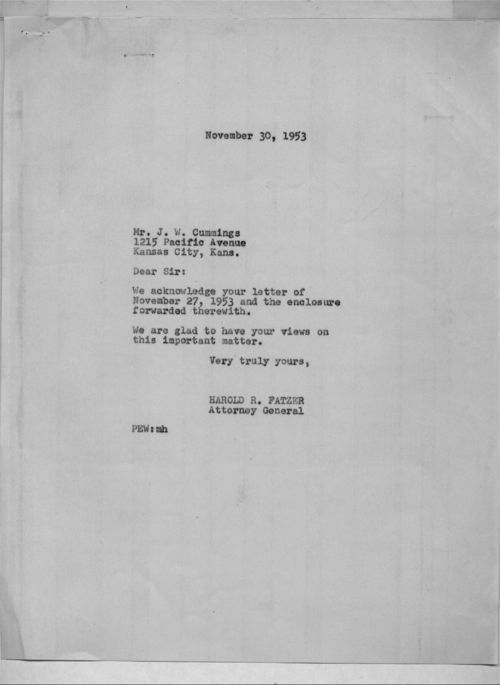 In this letter J. W. Cummings, a resident of Kansas City, Kansas, appeals to state attorney general Harold Fatzer to not desegregate public schools. According to Cummings, integration would lead to miscegenation and would be the downfall of society. He writes that "we must keep our country great by not permitting a Policing action forcing communities into a like pattern, forming a state against our will. We must have the liberty of community majority choice, to accept or reject the kind of life our children live." He also believed that those causing this "unrest" were violating the principles of democracy and had been unduly influenced by Communist doctrine. This source presents several different arguments supporting the status quo of segregation. In particular, students could discuss how Cummings considered it a violation of his rights to be forced into community with people of a different race. This could be contrasted with the African-American point of view, which asked that all members of this democracy be treated equally. Overall it is an excellent example of how some white Kansans viewed the Brown v. Board case.